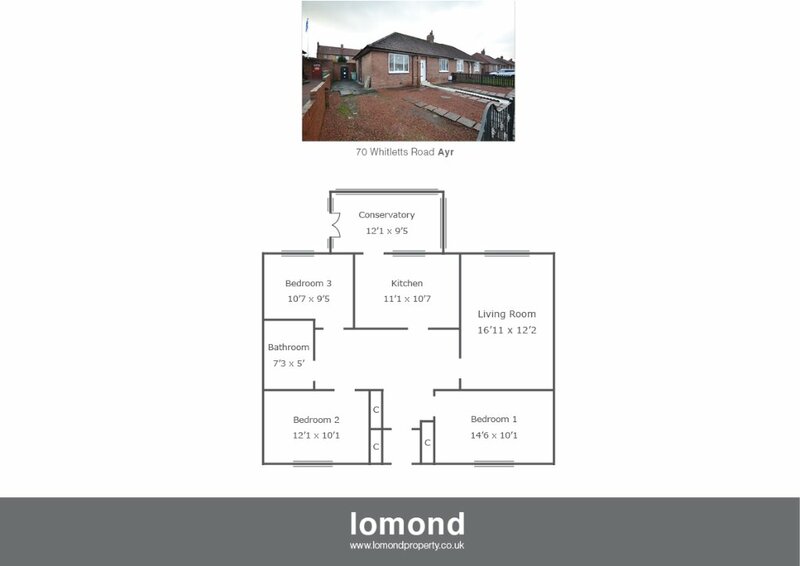 70 Whitletts Road is a rarely available semi detached bungalow situated just short walk from Ayr Racecourse. The property boasts three double bedrooms, with lounge, conservatory, stylish kitchen and recently fitted bathroom. The property benefits further from off street parking and easily maintained gardens to the front and rear. In summary the property layout extends to a spacious and welcoming hallway with storage cupboard off. To the rear of the property the lounge is generous in size with gas fire and views to the rear garden. All bedrooms are double in size with bedroom 1 and 2 benefitting further from fitted cupboard space. The stylish kitchen is a recent upgrade and comes well stocked, with floor and wall mounted units, integrated gas hob, oven, hood and breakfast bar. Off the kitchen to the rear of the property there is a conservatory which in turn allows access to the rear garden. The bathroom completes the “on the level” accommodation, and comes with bath, WC, WHB, and heated towel rail, all finished to modern wet wall paneling. Externally the property has grounds to the front and rear. To the front there is off street parking and gardens laid to decorative chips, with perimeter fencing. To the rear the garden is south facing, again laid to predominantly to decorative chips with a section of raised timber decking, ideal for summer dining. Whitletts Road is a pleasant residential area. Ayr town is close by and provides access to a range of amenities including supermarkets, bars, restaurants and town centre shopping. There are a number of local primary and secondary schools within the greater Ayr area.